Selecting the best nursing school in New Hampshire can be difficult. To make the process easier first look for a school that supports students towards licensure and beyond. A great way to measure this is through NCLEX-RN "pass rates." We have ranked the top 5 nursing schools in New Hampshire by analyzing current and historical NCLEX-RN "pass rates", meaning the percentage of graduates who pass the exam, out of the 15 RN programs in the state. Programs reviewed include schools that offer an Associate in Nursing (ADN/ASN), BSN, or Direct-Entry MSN Degree. With a growing need for healthcare practitioners, nursing employment in New Hampshire is ripe for the picking. In fact, New Hampshire Employment Security projects an average of 491 registered nursing job openings each year. Pair this with the average median annual salary of $67,190 (per the Bureau of Labor Statistics), and you have a an excellent incentive to move forward with a nursing degree in the "Granite State". Luckily, there's no shortage of nursing schools in New Hampshire to suit everyone's needs. 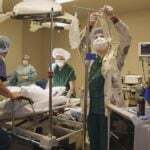 There are many programs you can take in order to receive a registered nursing license, and an Associate's Degree in Nursing (ADN) is an especially popular one. At 2 years in length, it's one of the faster options, making it ideal for those who want to begin working as quickly as possible. There are roughly 9 programs in the state that offer an accredited ADN program. 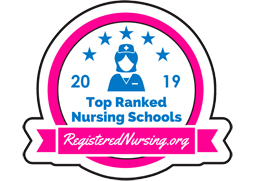 Proper accreditation from nationally recognized organizations like the Commission for Education in Nursing (ACEN) and/or the American Association of Colleges of Nursing's Commission on Collegiate Nursing Education (CCNE) is a great way to ensure that your school of choices offers a quality ADN program. Beyond that, you will also need to check with the New Hampshire Board of Nursing to make sure that the program is recognized in your state. Once you complete your ADN program, you are required to take and pass the National Council Licensure Examination (NCLEX) so that you can receive your registered nursing license from the state of New Hampshire. It is wise to take a thorough look at your school of choice's nursing curriculum and NCLEX pass rates to be sure that it will fully prepare you for this important exam. The American Association of Colleges of Nursing reports that in 2015, 709 individuals took the NCLEX-RN exam for the first time, and that 87% of new nurse grads who took the exam received licenses. River Valley Community College in Claremont, NH, is one example of a school in the state offering a fully accredited ADN program. Typically offered at community and technical colleges, ADN programs on the whole tend to be fairly affordable, especially compared to 4-year college degrees. To break it down a little, you'll need to pay for tuition and fees, as well as indirect costs including textbooks, transportation, equipment, and other mandatory expenses. Financial aid is often available for those with need; inquire with your school of choice to see what kind of payment plans and/or aid is available to you. To give an idea about costs, the tuition for the ADN program at NHTI, Concord's Community College is estimated at $200 per credit for New Hampshire residents, not including any additional fees like NCLEX-RN exam prep fees. For the right type of student, an ADN offers numerous advantages. The shorter 2-year length is certainly ideal for those wanting to get their careers started right away. The availability of this program at smaller community colleges makes it much more accessible for those living outside of main city centers, and the expense of the program at these types of institutions tends to be much more affordable than larger universities. The budget-conscious, eager-to-work student will thrive in an ADN program. An alternative schooling option for established Licensed Practical Nurses (LPNs), the LPN to RN bridge pathway is an accelerated program that leads to either an ADN or BSN degree. These programs take into account the LPN's prior education and experience, making the program substantially shorter than a traditional RN program. The LPN to ADN program is the quickest route to an RN degree. Those in New Hampshire can enroll in any number of LPN to ADN programs at community colleges throughout the state. NHTI - Concord's Community College offers an LPN to RN program that culminates in an associate's degree in just a few semesters of study. There are currently no LPN to BSN programs in the state, though national online options may be available to interested students. For those wanting to go above and beyond an associate's degree, a Bachelor's of Science in Nursing (BSN) is a smart route to take in order to become a registered nurse. This 4-year program follows a more traditional college path, and is often available at larger universities in the state. In addition to the pre-licensure BSN program, many schools in the region are now offering accelerated BSN programs as well as RN to BSN programs to fit a variety of needs. New Hampshire offers approximately 8 schools with accredited BSN programs scattered throughout the state. Schools and programs can differ dramatically, so it's important to find a BSN program that fits your individual needs. Aside from big factors like accreditation, cost, and program outcomes, things like school location can also make a big difference. It's also a good idea to see what type of BSN programs are offered at the school; if you already hold a degree in another subject, an accelerated BSN may be something to search for. Additionally, if you are already an RN via an ADN, you may want to see if your preferred school offers an RN to BSN program. Nashua's own Rivier University offers one of New Hampshire's properly accredited BSN programs. There are a few different types of BSN programs, each with a unique time frame. A traditional BSN, sometimes referred to as a "pre-licensure" BSN, will take 4 years (or 8 semesters) to complete. An accelerated BSN program can be completed in roughly 15 months. An RN to BSN option can take 1-2 years from start to finish, depending on whether previous course credits can be transferred over. BSN programs can be costly, depending on the school, but the potential for future earnings can make it well worth the price. 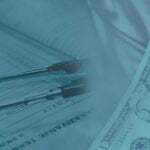 Required expenses include tuition, mandatory fees, labs, practice exams, uniforms, equipment, and more. Scholarships can cover some of the cost of the BSN if you are awarded any, as well as financial aid from your school of choice (if applicable). To provide one example, the BSN program at the University of New Hampshire in Durham, NH, will run you roughly $7,205 per semester for tuition only, as long as you are a New Hampshire resident. A BSN is great for those who know they want to achieve more advanced careers in nursing. Jobs like school nurse and medical-surgical nurse are just a few of many nursing titles that will require a BSN degree. Nurses who hold a BSN also have the potential to make higher annual salaries than those that hold lower nursing degrees. Due to the variety of ways one can earn an BSN, whether it's through the traditional route, the accelerated route, or via an RN to BSN, this nursing degree is accessible at many walks in life. A Master's of Science in Nursing degree (MSN) is another program available to nurses who want to advance up the career ladder. While you must already be an RN in order to apply for an MSN degree, nursing jobs such as Clinical Nurse Specialist, Certified Nurse Midwife, Nurse Practitioner, and other specialties await upon completion. 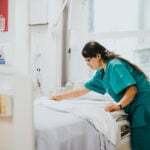 Along with more responsibility and greater career mobility, these nursing jobs tend to come with higher paychecks as well. Roughly 4 schools in the New Hampshire area offer accredited MSN programs for your perusal. You can expect an MSN program to last roughly 2-3 years, depending on the school and the prior nursing courses taken. Many schools also offer flexible MSN course schedules to fit around the schedules of busy working RNs. Part-time schedules, night courses, and online classes are often options. It's a good idea to see what kind of scheduling options your school of choice offers. 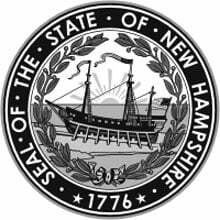 New Hampshire has a few affordable options for MSN programs, although if cost is a worry you can always consider scholarships and financial aid. Remember that tuition and any mandatory fees will need to be accounted for, along with indirect costs such as transportation, room and board, and other expenses. To provide an example on cost, tuition for the MSN program at Franklin Pierce University in New Hampshire is estimated at $660 per credit hour, not including additional fees. 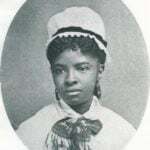 The added benefits of obtaining your degree in nursing has been noticed by nurses across the nation. In order to accommodate the increasing need for qualified nurses, colleges are offering accelerated BSN and MSN courses. In as little as 12 to 18 months you can earn your BSN or in as little as 24 months you can move directly from BA to MSN. Direct entry to either of these programs depends on whether or not you meet the entry criteria, if not, you may have to complete specific courses before the program start date. Costs should be recalculated with any added courses, so check with each program for more accurate information. Colby-Sawyer College's New London campus molds nursing students into high-quality nurses who are committed to improving the quality of care throughout the profession and judiciously use their leadership and communication skills to improve community health. In addition to their top tier BSN program, Colby-Sawyer offers MSN and RN to BSN programs. Learn more by visiting the Colby-Sawyer College nursing website. St. Anselm College, Goffstown in Manchester, New Hampshire has experienced nursing faculty that guide undergraduates into exercising their professional judgement in tandem with regulatory and system healthcare policies in order to see best patient outcomes. Get all the program details by visiting the St. Anselm College website. University of New Hampshire in Durham has excellent BSN and MSN pathways in the College of Nursing. Graduates are prepared to assume their professional role as a responsible and driven member of the nursing vocation. Check out the official University of New Hampshire nursing program. Lakes Region Community College in Laconia serves students through its excellent associate degree nursing program. LRCC's curriculum emphasizes safe delivery of care, evidence-based practice, and accountability. Follow the link to learn more about the Lakes Region Community College nursing program. Manchester Community College is located between Concord and Nashua and is home to an exemplary nursing program. MCC graduates are renowned for their accountability and dedication to patient service, as well as their clinical abilities. Check out the official Manchester Community College nursing program.